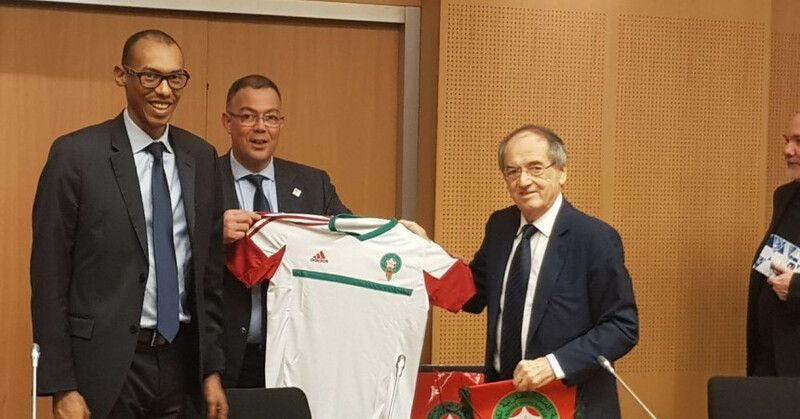 French Football Federation President Noël Le Graët pledged to back Morocco's candidature for the 2026 World Cup as officials from the North African country's bid began a promotional tour of Europe. Le Graët promised France would be a "strong supporter" of Morocco's bid during a meeting with Royal Moroccan Football Federation counterpart Fouzi Lekjaa in Paris. Former French President Francois Holland claimed earlier this week that the nation had "every confidence" in Morocco, which is going up against the might of a joint three-nation bid from the United States, Canada and Mexico. The support of France marks a boost to Morocco 2026 but does not guarantee Le Graët will vote for the North African country. Lekjaa is among the Morocco 2026 officials who have embarked on a tour of Europe in an effort to promote their bid to voting nations. Moroccan newspaper Al Ahdath Al Maghribia has reported the delegation will also travel to Belgium, Italy and Luxembourg during the visit. Each of FIFA's Member Associations, minus the four bidding countries, will be able to select their preferred host nation should both bids progress to a vote at the Congress in Moscow on June 13. A five-member FIFA committee is due to inspect both bids in the coming months, where they will grade and score each of the two efforts. It remains possible that one of the attempts may be ruled out before the Congress should FIFA inspectors decide it has not met their requirements, although any such recommendation would have to be approved by the ruling Council. Morocco only revealed exact details of their plans should they be awarded the hosting rights last week. Morocco 2026 has proposed 12 cities and 14 stadia, including existing venues in Marrakech, Agadir, Fez, Rabat and Tangier which will undergo renovation works to meet FIFA criteria. Two new stadiums will be built in Casablanca, including a 93,000 capacity National Stadium which would host the opening match and final, while new venues would also be built in Oujda and Tetouan. In addition, five "legacy modular stadiums", which could be downscaled after the tournament, have been proposed for Marrakech, El Jadida, Meknes, Nador and Ouarzazate. Morocco are bidding for football's flagship event for the fifth time after unsuccessful attempts in 1994, 1998, 2006 and 2010. The United 2026 bid remains the favourite despite concerns over the potential negative impact of President Donald Trump. United 2026 officials have downplayed the fears, insisting they have had "no backlash" from any country regarding Trump.